I want to invite you to join in for the upcoming Write Out project, an open learning adventure sponsored by the National Writing Project and the National Park Service and built off the concepts of the Connected Learning MOOC (CLMOOC) experiences of the past few years. I am one of the facilitators of this new experience. 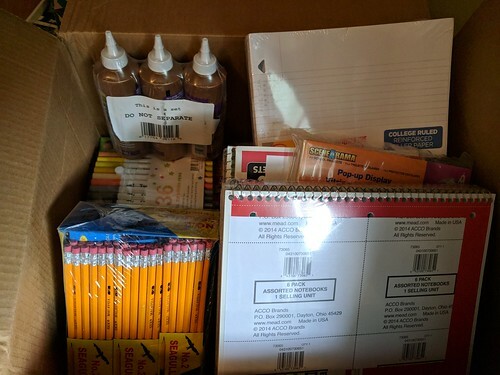 Write Out is being designed to connect educators to open and public spaces, such as the National Parks network (but not limited to those places), and we will be working on mapping as a central theme this summer. We aim to have teachers and park rangers and other explorers in the mix. Write Out officially begins on July 15 and will run for two weeks. There will be invitations for making maps and making connections, for making media and writing stories, and more. If you have five to ten minutes, we’ll have some suggestions. An hour? We’ll have suggestions. A day or two? We’ve got you covered. As with CLMOOC, you engage where it interests you, with no pressure other than a sense of connection and community. Our aim is to open more doors for teachers, and their students, to the outside world. If you go to the Write Out site, you can sign up for newsletters and information. I hope to see you in the mix this summer. PS — By the way, CLMOOC is still happening, too, in a sort of parallel and connected path as Write Out, with CLMOOC-inspired daily doodle prompts on map and open space themes, and art swap sharing activities happening. See more at the CLMOOC website. This book — Light the Dark — is a fantastic tour of the creative mind, as a few dozen writers talk about where their inspiration comes from, important moments that spurred them on, and the books and poems and passages that helped inspire them. Each small piece comes with a quote from a source of the writer’s inspiration and beautiful woodcut illustrations that draw you into the text. I read this collection over two months, dipping in now and then to savor the writing about writing (which I am admittedly a sucker for). The stories remind us that we find our inspiration far afield sometimes, and in unexpected places, too. Some novels, some poems, some small passages have the ability to resonate for years to come, in creative ways. Here, the writers — such as Junot Diaz, Stephen King, Amy Tan, Roxane Gay and a slew of others, ending with Neil Gaiman — explore their inner creative terrain. The result is a journey into the imagination and power of writing. What else might you want out of a book? 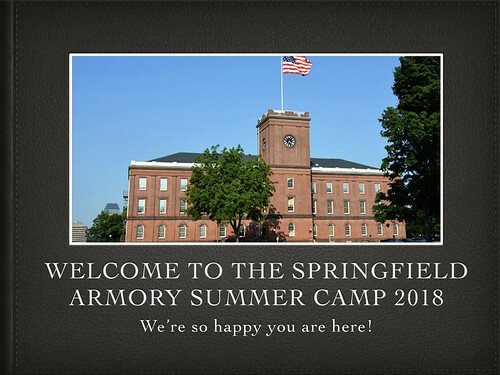 At our summer camp at the Springfield Armory, where our themes all week have centered on social justice issues, middle school campers explored the notions of the Double V Campaign — when returning WW2 African American veterans searched for racial equality and respect, and the end to segregation, at the home-front after serving as heroes in the war. Our visitor — Lee Hines — is part of the Veterans Education Project, and he has done extensive research on the Double V. Hines is also a decorated veteran of the Vietnam War. He flew airplanes and helicopters over Laos, Thailand and Vietnam. 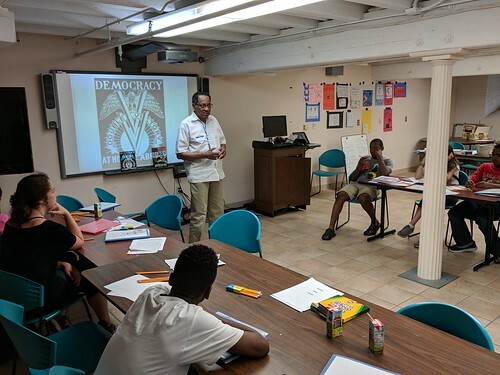 In his talk with the camp, Hines notes the ways the African American soldiers of WW2 paved the way for the Civil Rights Movement, and how the Double V Campaign sparked dissent in our country and caused government officials like FBI Director Edgar Hoover to move to squelch it. Earlier, we had watched a powerful digital film created for National History Day by other middle school students on the topic of the Tuskegee Airmen, whose heroism is now celebrated but whose existence at the time was the cause for much argument around segregation, military service and more. Our campers come from a social justice middle school, so these topics resonated with them. 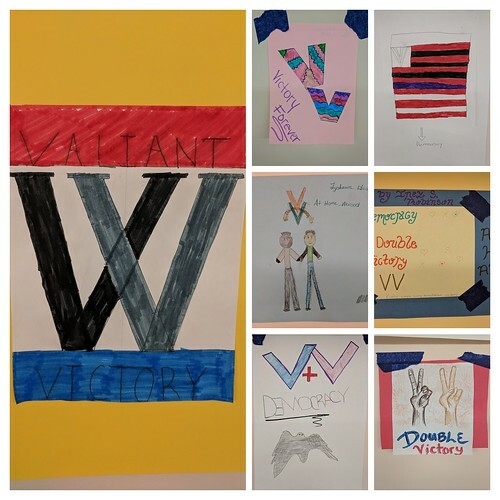 Following Hines’ talk, we had students create their own versions of a Double V Campaign poster, in hopes of getting them think about all of those brave men, and women, who fought against evil in the war and then came home, and fought against injustice in their own communities. 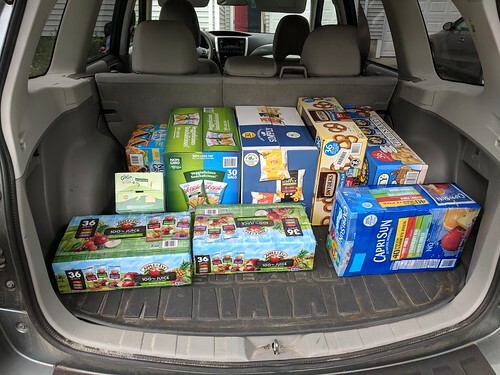 I wrote a piece that was published this past week in the local newspaper about some activities for our sixth graders at our school that seem to fall outside of our traditional curriculum, but which still have a huge impact on the learning for our students. This column, which honors the work of colleagues at my school, is part of a regular feature our Western Massachusetts Writing Project has in partnership with our local regional newspaper, The Daily Hampshire Gazette. 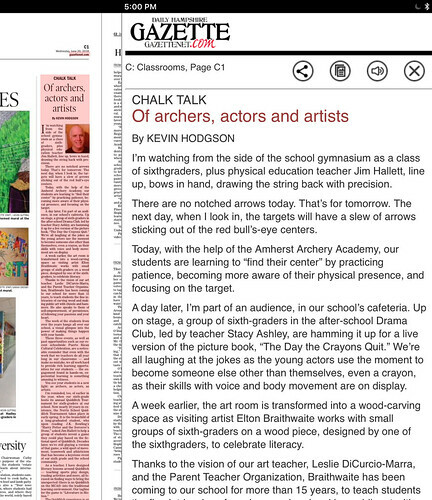 Each month, WMWP teachers are featured as columnists. I am always appreciative of any gift a student and family give me at the end of the year, but I am also a little uncomfortable with such gifts, too. My job is to teach. It’s my passion, too. Thank You’s are just fine with me. I don’t need gift cards or whatever to understand appreciation for our year of writing and reading together. 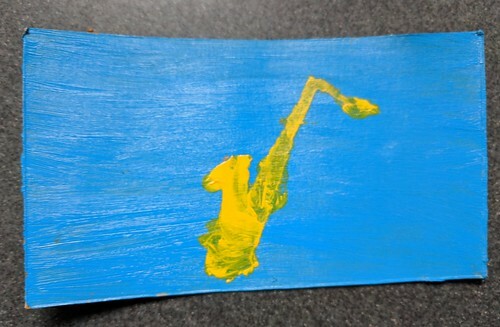 One student this year put paint brush to (recycled) cardboard and gave me her own painting of a saxophone. That’s my main musical instrument. Of all the tokens, this is my favorite, for it shows I shared myself with my students. (I also got a New York Giant mug and some New York Yankee pens). 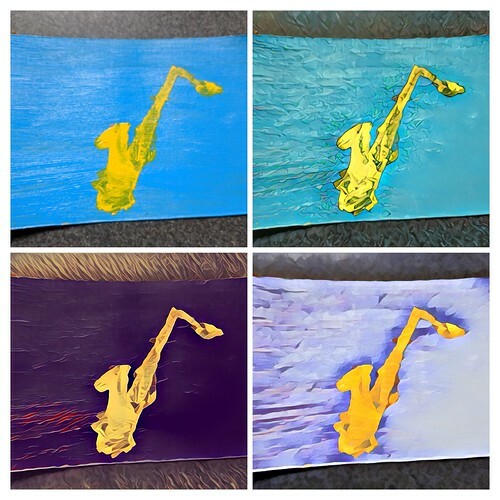 I loved this saxophone so much, I put it through some photo filters to make a collage. Yesterday was the last day with students. It’s an emotional day and at our awards ceremony, I try to lighten the mood a bit with my Flying Monkey Award. 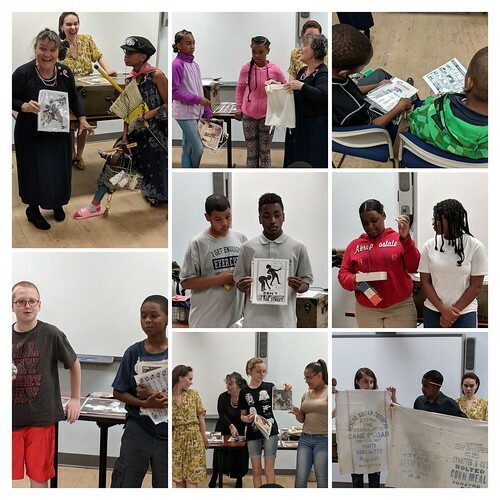 The Flying Monkey Award celebrates students who have completed every writing prompt from the year (we did 66 prompts this year, from short stories to arguments to designing theme parks to making comics, and much much more) and kept their notebook from prompt number one through prompt number 66. If so, their name goes into a lottery and four students get randomly chosen to get a screaming, flying monkey shot across the auditorium at them (by me, of course). They get to keep the monkey, by the way. It seems a fitting way to end the awards ceremony that ends the school year. This is the monkey shot, from another year. The calls for more diverse books, more diverse characters and more diverse writers has certainly paying off with a slew of amazing stories for audiences of all ages, providing different perspectives on experiences. I’ll put Sheela Chari’s Finding Mighty in that category, although her story would clearly hold up even without this talk of diversity. 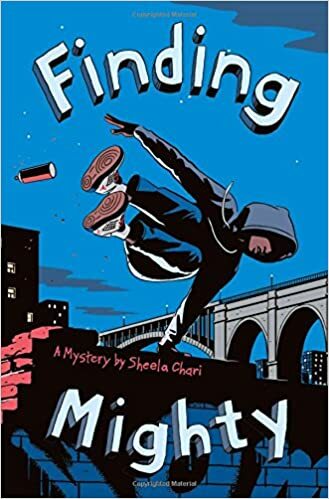 Finding Mighty is a mystery story, of sorts, with a small group of urban New York City youths searching for hidden diamonds. The setting is the city itself, with Parkour being part of how young people navigate the landscape. Graffiti art and family history, and a rotating narrative view of different characters all provide tension and atmosphere that moves this story along. While one of the main characters, Myla, is Indian-American and the other, Peter, is African-American, (and one of their friends is white with Netherlands roots), this range of ethnicity is part of the fabric of the story itself. Chari addresses the difficulty of assimilation and retaining cultural connections, but only in service to the story. We understand these characters better as a result as they develop friendship and kinship, and perhaps, we come to understand each other, too. 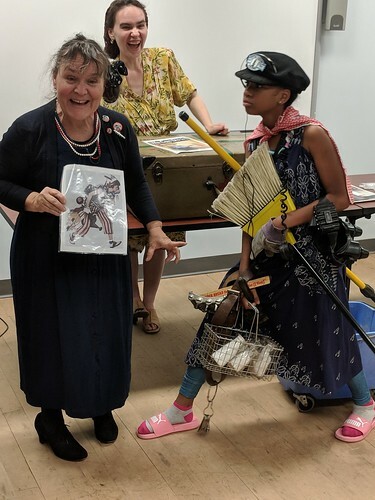 I enjoyed the ways the kids put together the clues they find, and how the family histories are part of the mystery, and the way that the city itself was nearly a character — with subway trains and tracks, the old Aquaduct water system as part of a map, historic houses, and more. It’s all woven together nicely. 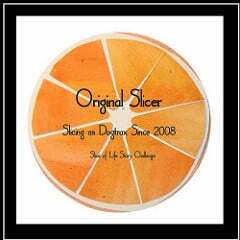 This book is very appropriate for upper elementary and middle school students.